A pair of impressive modern villas overlooking woodland and private gardens, Cedro and Amarena are found close to Polignano a Mare on the coast of Puglia. 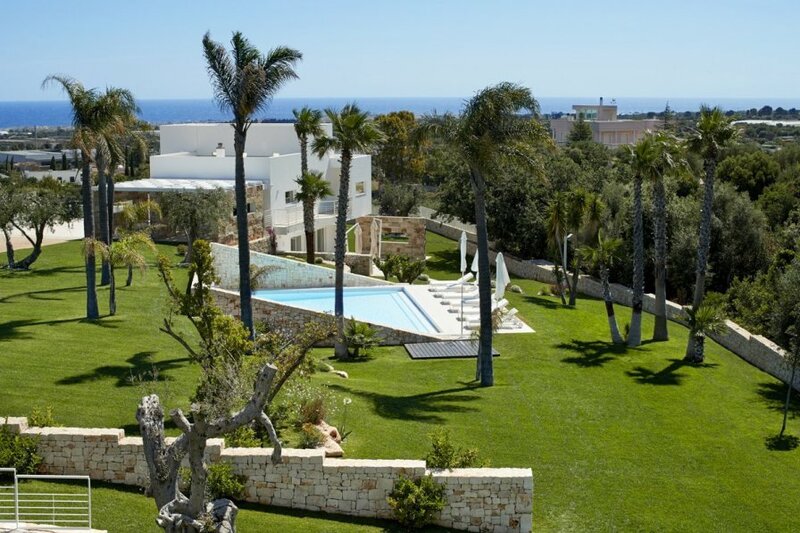 The villas are set amidst olive and almond trees, sharing the sheltered pool which is right outside. These villas are ideal for two large families or groups, each one enjoying privacy of own accommodation sleeping up to six guests. Elegantly styled and thoughtfully laid out on two floors, both feature three double bedrooms, all with private bathrooms, television and walk-in closets. Lots of space to dine inside and out gives you plenty of choice for socialising, and the vast gardens include covered terraces for lounging around in the shade. Views extend out the ocean here, and dry-stone walls give the grounds an authentic rustic feel. As well as relaxing by the pool and taking leisurely breakfasts in the garden, you can also enjoy the delights of optional massage or spa treatment on site. A harmonious space is dedicated to wellness, where mind, body and spirit receive the attention they deserve. All the family can have some time to themselves – children will love the outdoor play area. There are yet more ways to feel reinvigorated in Puglia and our concierge team will be pleased to help you get out and about. Cycling and boat trips, city tours and cooking classes are among the extras available – make the most of them, because both the scenery and the food will be worth it! Other additional services, like laundry, housekeeping and daily breakfasts are available too. The stunning coast and countryside of the Puglia region are not to be missed, and you have much to discover within a short drive of the villas. Head into Polignano a Mare, where spectacular cliffs surround the beach and explore its maze of ancient streets and near-endless selection of restaurants. History lovers will get a kick out of Ostuni and Martina Franca and may want to drive a little further down to the ever-impressive city of Lecce. Whatever you seek, you are sure to find it close to Villas Cedro and Amarena. Villas Cedro & Amarena are superbly positioned, offering quick and easy access to main route to discover the enchanting town of Polignano a Mare, which sits atop limestone cliffs looking out across the Adriatic. Those spectacular sea views and its sandy, Blue Flag beach make it a favourite destination, as does the pretty centre. The cliffs which surround the beach attract many cliff-divers and Polignano a Mare enjoys an international reputation as a prime destination for the sport. Polignano a Mare is an excellent base for exploring the region in all directions. Midway between the cities of Bari and Brindisi, it's also close to eye-catching Ostuni, Alberobello and Martina Franca and only 15 minutes' drive from the attractive coastal town of Monopoli, where you will find even more history and chilled-out beach life.